Yesterday I go on the hot seat. In the previous tribe meeting, I feel "hot" and want to go on the hot seat but I decide against it based on the time left in the Tribe meeting. In this meeting, I want to send another tribe member to the hot seat but he declines and suggests that I go. I don't feel particularly "hot". I know the core "issue" isn't resolved yet but I don't feel it strongly. I decide to go on the hot seat anyway to see what transpires. I don't expect for much to happen. As soon as I sit on the hot seat and get settled though, I feel woozy. I find it strange cause there is no real prompt. I'm only talking through my story (fear and insecurity related to the markets and my own situation) which I do often but this time there are other, stronger palpable sensations. My receivers encourage me. I feel this constriction in the throat. They encourage me to "crank it up". I do and I am now coughing violently and gagging. I remember that this was my first reaction on my hot seat in the December workshop as well. I cough violently for a long time. I later realize that I had even coughed some lining / a little bit of blood. After a while, the coughing subsides but I still feel a slight irritation in my throat. My receivers encourage me to stay on task and after a while, I feel it dissipate and then I don't feel it anymore. During this part, strangely, I keep thinking of an episode in my early childhood when I get separated from my mother and am momentarily lost. I don't get asked to freeze my form and try and recollect an earlier incident yet but this memory surfaces anyway. I process various other forms (goose bump like feeling on my right cheek and then on my left cheek, pain in my foot, turning my head to the extreme right and then to the left [sometimes during my meditations, I feel the same need], stretching my foot to experience the pain, a pulling sensation in my forehead, occasional burning sensation in my lower chest like some hot fluid flowing down). I experience these forms and describe them to my receivers. I also experience a "parallel" conversation in my mind. "Am I experiencing these fully? ", "Are they going to ask me to freeze now? ", "If they ask me to freeze, would the story about my being lost briefly in childhood be appropriate? ", "Should I be having this conversation in my head if I am experiencing my feelings? ", "Am I fully experiencing my feelings?". I also "naturally" think about process management and what's likely to, "should" come next. As a part of this parallel conversation, I also realize the immense value of the Tribe. I question, in the past, why the DIM process does not work. I wonder that if one can recognize and feel the sensation and process it, it "should" be the same. However, I feel a certain palpable power on the hot seat with the Tribe. I also feel that were it not for the constant encouragement and acknowledgement, I would naturally fall off track and not go as far as I do with the Tribe. While turning my head to the extreme right, I freeze my form and am asked to recollect a memory. I recall another childhood incident that hasn't occurred to me for a while, where I fall into an open manhole while running with my brother. I don't know what to do with two childhood incidents. I suggest we role play both. During the first role play (falling into manhole) I get into the situation but don't feel any strong emotions. I feel stunned and am then listening to voices above me. We close after sending and receiving feelings at my rescue. In the second role play (getting separated and lost briefly) I don't feel much either. I struggle with the role play not feeling authentic and we re-start a couple of times. I don't feel any fear. However, after reunion with my mother, I feel fear, the way I normally feel it … a cold sensation over my chest … like I have an ice pack on my chest over my heart. Two other receivers (role-playing) experience somatic feelings as well. We are all feeling the same feelings at one point (heaviness in hands, heaviness in legs / feet, feeling in the chest). We all process these feelings together. The tribe members report various insights related to their own children after the role plays. Normally, on the day after a Tribe meeting where I am receiving, I feel exhausted and drained. Not so today. I do wake up with a set of red bumps on my right and left cheeks with a feeling similar to the one that I had (of goose bumps) during the hot seat yesterday. By the end of the day, they're gone … as is the feeling. a. "Is it ok" for the Process Manager to also adopt a role in the role play if there aren't enough individuals? b. "Is it ok" for an individual to role play two roles if both are brief and there is a time separation between the role "coming up" if there aren't enough individuals? I see no particular problems with people assuming multiple roles. I would like to know if your new trading book is finished. I have already bought your previous book “The trading tribe” and I am waiting for this new opera of yours. Wow, it’s here sooner than I thought! I had written to you last year and you had replied on FAQ. Will be very much interested to meet you during your visit to India. I have been working on myself to become a better person. Recently I attended few meditation and individual sessions in Osho Resort Pune, India. Remembered you a lot over there. Had many AHA moments there. They also advise living in the now! They have different meditations which cover breathing. I observed during silent meditation that I have this tendency to remain tense. The tenseness is always there in my hands and calf muscles as if there is a danger somewhere. This tendency always protects me from all market downtrends. I have always been able to sell near all tops. My awareness levels are going up. Learning to receive others has started. In spite of making few millions last year, I just stopped my biz this year. Just did not feel like continuing. As if there was no need or motivation. Now I realize today that I actually want to devote more n more of my time to learn, read and understand my own self. Reading good books and your FAQ will help me become a better person. I have a long way to go. I'm going through my divorce proceedings this year and suddenly realized that another reason I did not want to continue my biz this year was that I did not feel that the other party deserved my making more money. So just like your statement "Everybody gets what they ..." I got what I wanted. Thanks for your FAQs. I am realizing the way I have behaved and continue to behave. Your FAQs are helping me. Ed - hope you're well. Thinking of you and the ranch, which seems to be in the path of the Bastrop fires. Reading about Austin area wildfires. Hope you're OK? The wind of change blows through the Amsterdam Tribe right now.... but first, how are you!? I hope this email finds you in good health, as I feel concern when you do not update FAQ for so long & wonder if TTP becomes a passing AHA!... ? For the last 18 months or so, I feel a deep yearning to take a week off to simply be alone in silent meditation. Finally last summer, I decide to attend a 10 day Vipassana retreat in a tradition that I first encountered in India in 1975 (http://www.dhamma.org/). Whilst the retreat is initially physically very hard - sitting still for up to 11 hours each day brings all manner of physical aches & pains - I feel deeply renewed by the experience. I feel reconnected with the path I want to tread and which I have no doubt leads towards Right Living. However, I also realize that my ongoing participation with TTP comes to an end: I do not anticipate this, but see that it is so. This particular form of Vipassana meditation is unique in that it involves "scanning" the entire body from top to bottom, bottom to top, observing all sensations as they arise and pass away - without judgement, neither expressing nor suppressing them. This process becomes ever more subtle, & at times reaches beyond all sensation to the very ground of Being where there is only the pure, perceiving consciousness. A remark you make at the Austin workshop last December suggests to me that this is not unfamiliar to you. Since co-founding the Amsterdam tribe in 1976 & attending two workshops with you, I benefit so much from TTP, the essence of which remains with me. I feel so much gratitude to you, Ed, and to all those tribe members, here in Amsterdam and in workshops that I encounter along the way. I leave my tribe in the very capable hands of its new & enthusiastic chief, who sends you an updated TTID. Thank-you, Ed, & until our paths cross again. Bastrop, Texas is in the news for all the wrong reasons..
Hope things are going well in your area. Is Banjo creek pumped dry? I'd like to get more information on your Trading Tribe, and would like to learn more about your style of trading. Thank you for making me a better person and helping me experience the Aha moment in building and running my trading strategies. It is well and truly amazing how much I have learned from you! I really appreciate it. I heard various reports that the fire had jumped the river and figured the pastures would go rather quickly, but wouldn't be enough to catch the forests near you. The Lost Pines near Bastrop were a tinderbox - pine burns fast and hot. Glad to hear the house is OK. I hope your tenant's livestock are all right. I sent the latest burn map in a separate email - it was published last night at 10pm. There is also a map of the Union Chapel fire - would you like that one too? A book I read years ago about the smoke jumpers who died fighting a fire in Montana years ago in a blow up talked about the technique Indians used to defend themselves against a roiling prairie fire advancing so quickly they couldn't outrun it. They would light a "back fire" downwind of where they were, which would quickly burn out the grass fuel, and they would then take shelter in the burned out area and the main fire would reach them, burn around them, but they would be safe in that burned out buffer zone. Ed - thanks for the update. The map clearly shows the extent of the burn areas of your land. It seems to have not yet crossed the railroad grade. I wonder if you know how to get the latest burn maps. 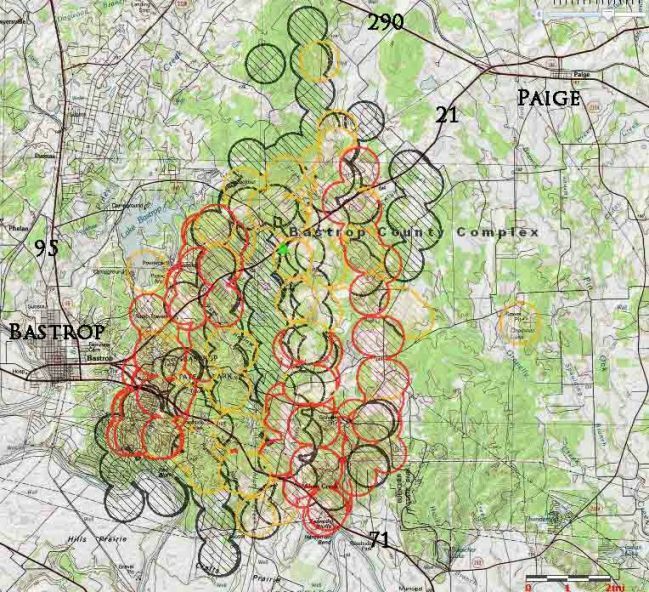 I've been reading about the fires in Bastrop. Hard to make out what exactly is affected while sitting here. Is all well at your end at the Ranch? Let me know if you need any help. I have lots of friends in Austin that could help out if needed. Read the news about fires in Bastrop. I am not sure if you are still on the world tour. I was concerned if you and your ranch were affected. I miss the great work the tribe did together - I got a lot out of it. The fire gets as far as my ranch and then goes out. 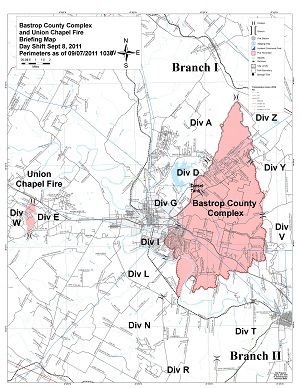 Attached is the latest map posted to the Bastrop Emergency Management facebook page this morning. Thank you for everything you have taught me so far. I am starting a website called www.extraordinarytrader.com to post helpful material for traders to better themselves. I would like to know if I could post the picture, attached to this email, to my website under the behavioral finance section? The website is non-profit and for informational use only. Yes, you may use the photo, with accreditation. I enclose the completed Word document which I hope you will make available on your site. I have been in touch with the leader of the London tribe who has told me he cannot accept any new members since the tribe is already large. He offered to put me on the waiting list but I declined saying that my interest in the Trading Tribe culture is immediate so I've taken the initiative and would like to start my own tribe in Southampton. My name is [Name] and I am interested in signing up for one of your TTP workshops. Are you still offering these? If you are not, can I sign up for some coaching with Ed?